We're not just another camp! We at tinkersol, is all about creating an inspirational platform and next generation tool set that will empower kids to innovate and dream big! Together, we can create a fun, and deep leaning experience! We're a young technology education company with an audacious goal to make next generation technologies available to younger kids. You get to be part of something ground-breaking, and lot of fun, but more importantly - inspirational! 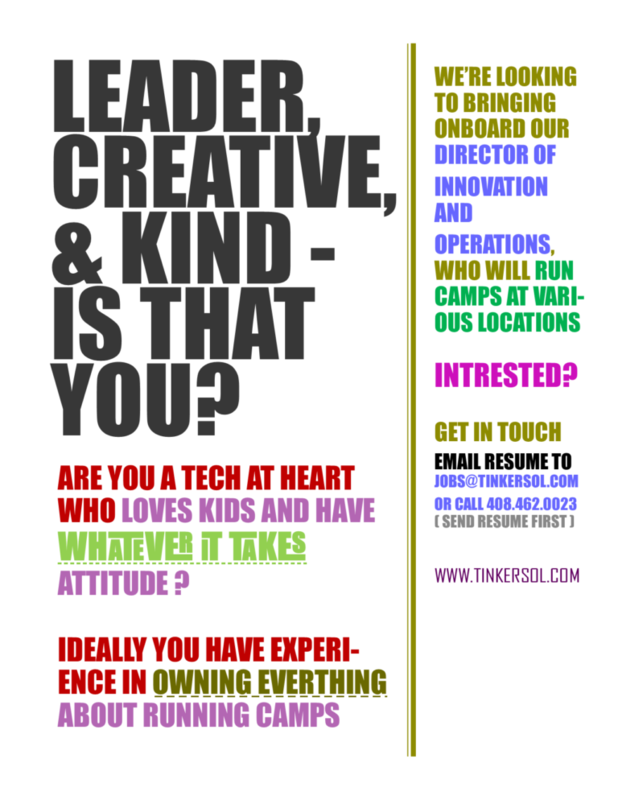 What does it take to join our dynamic tech educational startup in the heart of silicon valley? Learn absolutely incredible science and advanced technology stuff - like drones, robotics, AI etc. Well, you get the idea. If any of this don't intimidate you, we encourage you to review our job listing below and see where you might be a good fit. 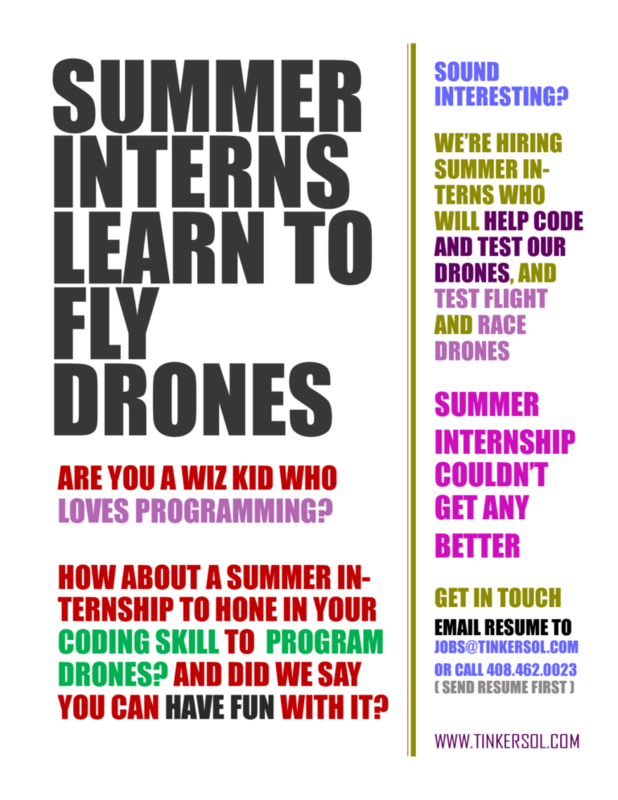 We're accepting summer internships now! Take a look at the job description to the side. If you think you would be a good fit, fill in a quick online application or just send an email to jobs@tinkersol.com with a cover letter indicating the job title, and why you would be a great fit. 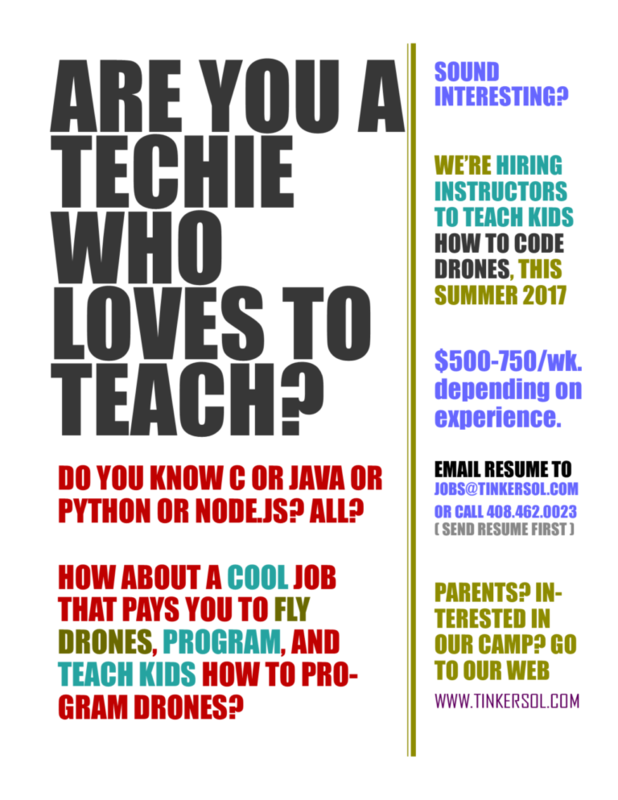 We're actively hiring for Summer 2017 now! Take a look at the job description to the side. If you think you would be a good fit, just send us an email to jobs@tinkersol.com with a cover letter indicating the job title, and why you would be a great fit. We're looking to bringing on board our Director of Innovation and Operations. S/he will bring at least 3 to 5 years experience in a similar capacity or have what it takes to become one. Prior experience in operational aspects of running tech camps is necessary.